You’d be forgiven for not realising that Stealing Sheep were playing at The Oast House in Spinningfields tonight. Yes, there’s a stage set up but that’s been there for a few weeks now without any obvious action. There are no posters, there’s been no promotion. Google is coming up with nothing. But according to the Silent Radio Gig Guide, it’s going to happen. Apparently we’re in the midst of Spinfest, and apparently Slow Club played last week. So, your writer boldly runs the gauntlet of Spinningfields wankers having a post-work pint in their suit jackets and expensive jeans in order to find out the truth. I find out, via Disaronno’s Twitter account of all places, that the support act is All We Are and they are on at 8:15. They’re beset by a combination of sound problems and rain, which means most people are huddled under the canopy towards the back despite their best efforts to entice people forward. They make a nice kind of dream pop which, at its best, sounds like Delays (remember Delays?) or Bombay Bicycle Club’s most mellow moments. It’s nice enough, and they’re at their best when they inject a bit of funk into their sound, but it’s all a bit beige for me. The rain has stopped by the time Stealing Sheep climb onstage clad in sunglasses and launch into the jerky electronica of ‘Sequence’. There’s barely enough room for all their gear on the little stage with their banks of synths, samplers and percussion and a lone guitar speaking volumes about their progression from psych-folk to something far more danceable. The robotic handclap-driven ‘Apparition’ makes full use of all this kit, a balancing act of glistening synths led by the three-part harmonised chant of the word “trouble”. The band’s irrepressible enthusiasm is completely infectious and the small crowd of people who are actually there for the bands and not just to discuss the day’s sales figures has now migrated to the front of the stage. They’re welcomed by the pop sheen of ‘Love’, the ascending bassline echoing the verse riff from ‘Jenny Was a Friend of Mine’ by the Killers, of all things. The sunglasses come off for a foray into folkier territory, the textures of ‘This Time’ and debut album highlight ‘Gold’ weaving and shifting like latter-day Radiohead. Drummer Lucy Mercer belts out the acapella opening line “Don’t let the daytime fool you that you’re not real” to usher in the irresistible bassline of their second album’s Not Real‘s title track, and the gremlins in the sound desk are making sure no one misses it as it dominates the mix. As the rain makes a reappearance, so too do the sunglasses and the Kraftwerk-in-multicoloured-tights pop of ‘Deadlock’ soon gets the small crowd of brollies moving. Not Real is one of the best albums of the year so far, and its highlight ‘Greed’ is all droning vocals and layered percussion building to a climax that perfectly summarises their blend of fuzzy electronics and pagan folk. They finish with fan favourite ‘Shut Eye’, the circular lyric “You should’ve got a better bed/Better for your head/Better heads need shut eye” somehow morphing into a chant from the crowd of “steal more sheep” as they exit the stage. 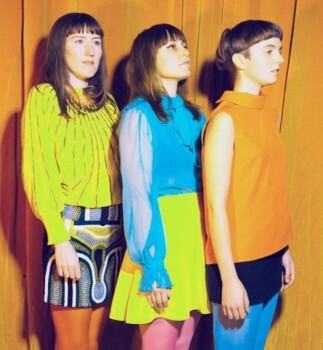 Stealing Sheep are a better band than Spinningfields deserves and bands of the calibre of Stealing Sheep and Slow Club certainly deserve better than the total lack of promotion offered by Spinfest. It speaks volumes that, pushing through the bar afterwards someone is overheard noting how busy it is for a Wednesday. It’s fair to say that two gigs over two weeks doesn’t exactly constitute a festival, and a few tweets from a sponsor’s account doesn’t exactly constitute promotion.